Campaign for a New Workers� Party spokesperson Pete McLaren confirmed today that TV star Ricky Tomlinson, best known for his performances in the Royle family, would be amongst the speakers at the second annual conference of the Campaign for a New Workers� Party (CNWP) at University College London on Saturday May 12th (12 - 5pm). �We are delighted Ricky Tomlinson has agreed to speak at our conference�, said Mr McLaren. He is a long standing socialist and trade union activist, and when he spoke at a recent CNWP event in Liverpool, over 250 people heard him talk about the need to campaign for a political alternative to New Labour for working class people - and this is the theme he will be pursuing on May 12th. He agrees with us that New Labour is a Tory party nowadays - or as Ricky himself puts it, �New Labour - my arse!� He also agrees that there has got to be one unified left wing party that has the interests of the working class at heart,� Pete McLaren concluded. Other speakers at the conference include Chris Baugh, PCS Assistant General Secretary, and Coventry Socialist Party Councillor Dave Nellist, Chair of the CNWP. 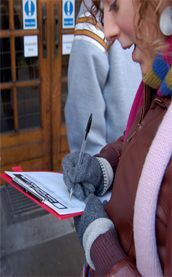 �The CNWP was only launched last year, but already it has over 2,500 supporters signed up,� Cllr Nelllist added. �This year�s conference will mark the next stage in our campaign to build something democratic, socialist and viable to provide working class people with a socialist alternative to the right wing policies being pursued by all three establishment parties,� he concluded.